Comments: This picture was taken the day that Jimmy Horton won the Champ Car Race in the Mateka 3N1. Looks like a lot of work to maintain a mile dirt, but it's always worth it when it comes to excitement! 11/20/04 D.J. Everitt Not sure, but it looks like Bettenhausen in the #12 in 1st and Billy Pauch in the #74 dueling it out for 2nd. 10/09/05 Dwight Clock If this was taken the day Jimmy won, it was July, 1983. 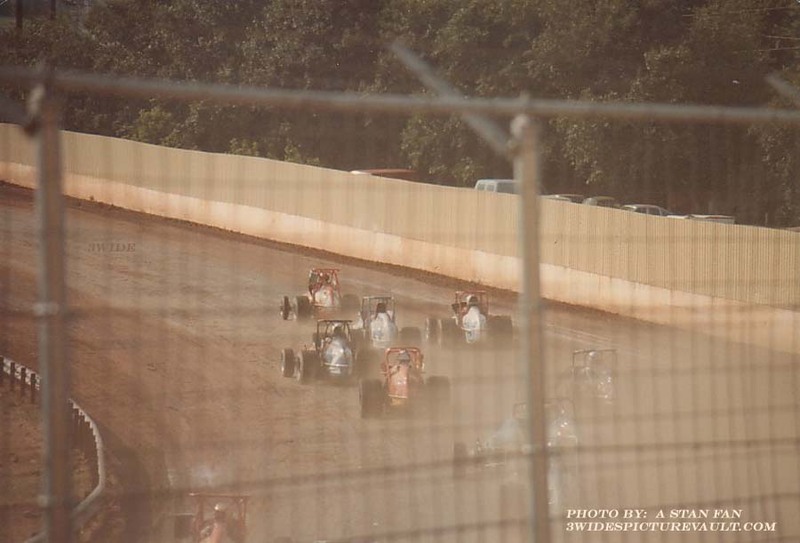 After Lindy Vicari reopened the track the USAC Silver Crown cars ran three shows there. December, 1982 won by Keith Kaufman, March, 1983 won by Gary Bettenhausen, and July, 1983 won by Jimmy Horton.